Allow the island to erode on the ocean side, become submerged on the bay side, and possibly disintegrate and become uninhabitable (abandonment). By fill we mean placing sand, mud, or other soil materials onto dry land to elevate its surface, or into wetlands or a shallow body of water to create new dry land from what had been wetlands or open water. Dikes and island raising do not involve rolling easements, while an engineered retreat or abandonment could. Dikes are unlikely to be the primary response to sea level rise on barrier islands, so this section only discusses the other three approaches. Figure 7. 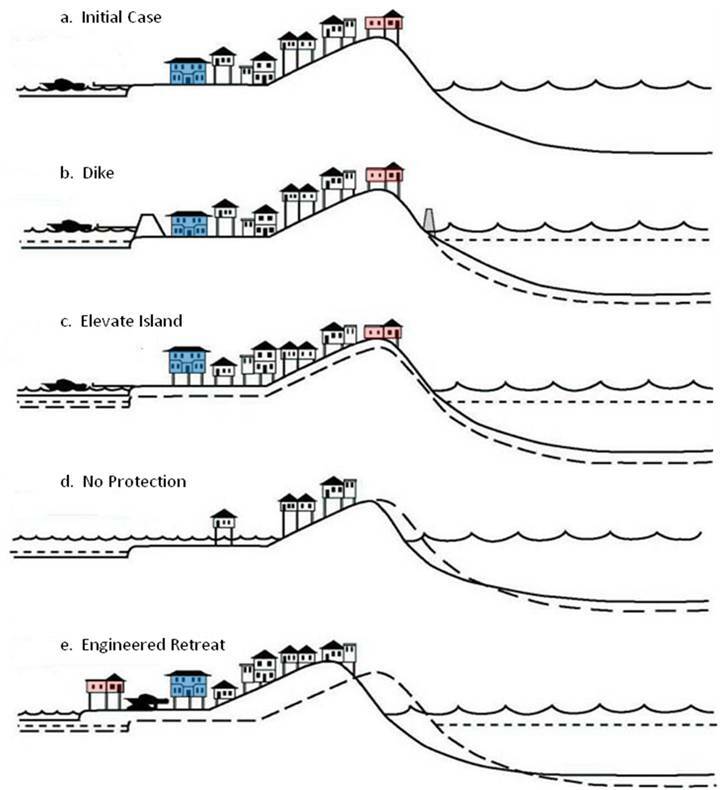 Four General Pathways for Responding to Rising Sea Level on a Barrier Island. The initial case (a) shows the cross section of a developed barrier island. If sea level rises, (b) lowlands could be protected with a dike, but a barrier island below sea level would be hazardous. A more common approach is to (c) elevate the beach profile with a sand replenishment project; and individual landowners may also choose to elevate their lots to prevent increased flooding. If no shore protection occurs (d) the islands may become narrower as the ocean side erodes and the bay side becomes submerged, which would reduce the number of developable lots. An alternative is (e) to imitate the natural overwash process by creating a new bayside parcel to replace the parcel lost on the ocean side. Source. SEA LEVEL RISE AND BARRIER ISLANDS. See note 113. Before the 1960s, creating new land by filling the bay sides of barrier islands was common and beach nourishment was rare. Communities were not engaged in a conscious engineered retreat at the time: Oceanside erosion was a fact of life along lightly populated barrier islands, and states allowed (or encouraged) people to convert wetlands on the bay sides to developable dry lands. Concerns about the environmental impacts of filling wetlands and shallow waters generally ended that method of creating developable dry land. Nevertheless, the practice of filling bay sides has been part of the effort to prevent undeveloped barrier islands in Louisiana from disintegrating. The cost of creating (or saving) land by filling the ocean side is inherently many times the cost of filling the bay side. At about the time people stopped filling bay sides of barrier islands, sand replenishment projects to fill the ocean sides became commonplace. This practice is expected to continue. The environ-mental consequences of dredging sand and filling ocean shores are often noted, but government agencies have almost always decided that those impacts are acceptable, given the alternative of oceanside erosion. Yet as sea level continues to rise, the cost of shore protection will increase. Many geologists doubt that sand replenishment will be a sustainable response for most barrier islands if sea level rise accelerates. Even if it is sustainable, the costs will accelerate as annual sand requirements increase and sand becomes more costly when least-cost supplies are exhausted. If sand replenishment becomes too costly, those who pay for it will logically look for less expensive alternatives. Although environmental regulations currently favor sand replenishment over an engineered retreat, no study outside Louisiana has directly compared the environmental impact of filling the bay with filling the ocean. Another alternative would be to allow an island to erode and make no effort to build additional land on the bay side. On some narrow islands, natural processes can create new bayside lands known as overwash fans as storms and winds bring sand from the ocean beach to the bay. But common land use practices on developed islands have stopped the overwash process. Restoring overwash might enable an island to migrate inland as with an engineered retreat; but such restoration is more difficult than creating the same land artificially. Along islands where new bayside lands are not created, narrow islands may erode on both the bay and ocean sides, and either disintegrate, become segmented with more inlets, or otherwise become uninhabitable. The relatively wide islands would generally narrow until reaching a critical width, at which point they would migrate (or disintegrate) like other narrow islands. Barrier island residents and businesses would strongly oppose the elimination of their communities. There is no general rule about whether allowing a previously developed barrier island to disintegrate is environmentally preferable to artificially maintaining the island. The restoration of disintegrating barrier islands in Louisiana was undertaken primarily to protect estuarine wetlands from storm waves. Some scientists have expressed concern about the impact of increased salinity and tide range in Pamlico and Albemarle Sounds from a deterioration of the Outer Banks barrier islands. These concerns may justify efforts to prevent those islands from deteriorating. But the question has not been evaluated in detail for most estuaries. Given the absence of analysis to demonstrate that any of the three options would be clearly superior, this primer assumes that island raising, engineered retreat (or a similar retreat caused by natural overwash), and abandonment could each be a preferred option in some cases. Because Sections 2.1 to 2.4 have examined the issues that can arise with a generally retreating shore, we now turn our attention to some additional issues that may be associated with the creation of bayside land from either an engineered retreat or from natural bayside accretion. Along a retreating mainland shore or a shrinking island, the essential feature of a rolling easement is the set of rules under which open water, wetlands, beaches, and public access migrate inland. Along a migrating barrier island, a rolling easement policy would do the same thing on the ocean. But on the bay side, it would do the opposite, establishing expectations for shallow waters and wetlands to become privately owned dry land. The bayfront owners would not be confronted by the loss of land and home. They may have to prepare, however, for eventual loss of waterfront access or views of the water, or for bayward relocation of their homes onto newly created land, to retain access and view. The simplest possibility would be an incremental landward migration, with new bayside parcels offsetting the loss of oceanside parcels. That possibility is depicted along with other responses to sea level rise in Figure 7, which originally appeared in a study of Long Beach Island, New Jersey, a narrow barrier island with single family homes on small lots. The study concluded that elevating the island in place will be the most feasible pathway at first, but after the sea rises a few feet, the cost savings from an engineered retreat is likely to outweigh the considerable administrative challenges. Larger and less frequent land reclamation may be more cost-effective and better facilitate possible long-term plans. Even if the community is satisfied with existing land-use, it may still be more efficient to create an entirely new city block on the bay side, and eventually move all homes on the existing bayside block to the new bayside block. Otherwise, creating new bayside lots would harm yacht clubs, community parks, waterfront owners, and even people who like their views of the water. Gradual depopulation of another part of the barrier island or a nearby barrier island. E.g., U.S. Global Change Research Program, Global Climate Changes Impacts in the United States, 88, 109, 152 (2009). Intergovernmental Panel on Climate Change, Climate Change 2001: Impacts, Adaptation, and Vulnerability 357360 (2001). In this context, retreating shores includes the inland migration of floodplain boundaries as well as wetlands and beaches. E.g., M.L. Schwartz, The Multiple Causality of Barrier Islands, 79 Journal of Geology 9194 (1971). Stephen P. Leatherman, Barrier Island Evolution in Response to Sea Level Rise: Discussion, 53 Journal of Sedimentary Research (1983). Other possibilities that we do not consider in this primer include tidal deltas from new inlets, the land created as inlets migrate, and new deltas created when rivers change course. James G. Titus, Greenhouse Effect, Sea Level Rise, and Barrier Islands, 18 Coastal Management 65, 69 Fig 4 (1990) [hereinafter Sea Level Rise and Barrier Islands]. Id. at 73. U.S. Environmental Protection Agency, Potential Effects of Global Climate Change on the United States 131 (1989) [hereinafter EPA]; CCSP, supra note 3 , at 204; and Coastal Areas and Marine Resources Sector Team, The Potential Consequences of Climate Variability and Change on Coastal Areas and Marine Resources 5356 (U.S. Global Change Research Program 2000). Richard A Davis, History: Coastal Geomorphology, in Maurice L. Schwartz (editor), Encyclopedia of Coastal Science 523 (1995). Examples include Long Beach Island and New Jersey; Coney Island, New York. R.A. Davis, R.A. & P.L. Barnard, in K. Pye, et al. (editors). Coastal and estuarine environments: sedimentology, geomor-phology and geoarchaeology. Geological Society Special Publication No. 175 293303 (2000). The first artificial beach project was at Coney Island in 1922. U.S. Army Corps of Engineers. Coastal Engineering Manual I-3-13 (2008). A few sand replenishment projects took place during the next few decades, but beach nourishment did not account for the vast majority of shore protection costs until the 1970s. Id. at I-3-21. Many Atlantic Coast communities received emergency beach nourishment after the Ash Wednesday Storm of 1962. See, e.g., Institute for Water Resources, U.S. Army Corps of Engineers, Dynamic Sustainability: Shoreline Management on Marylands Atlantic Coast 37 (2009). National Research Council, Beach Nourishment and Protection 102 (1995). See, e.g., supra note 57 (Florida); Richard A. Davis, Jr. & Gary A. Zarillo, Human-Induced Changes in Back-Barrier Environments as Factors in Tidal Inlet Instability with Emphasis on Florida. U.S. Army Corps of Engineers 58 (2003) (Florida and Texas); and Karl F. Nordstrom, Paul A. Gares, Norbert P. Psuty, Orrin H. Pilkey Jr., William J. Neal, & Orrin H. Pilkey, Sr., Living with the New Jersey Shore 51 (1986) (New Jersey). Fortification of deteriorating barrier islands in Louisiana has focused on adding sand to the islands themselves and shallow waters on their bay sides, rather than to the beaches. See, e.g., Louisiana Coastal Wetlands Conservation and Restoration Task Force, Isles Dernieres Restoration East Island (TE-20) (2002, revised 2010); http://lacoast.gov/reports/gpfs/TE-20.pdf, cited on November 1, 2010; Task Force, Whiskey Island Back Barrier Marsh Creation (TE-50) (2010); Task Force, East Timbalier Island Sediment Restoration, Phase 2 (TE-30) (2010); and Task Force, Pass Chaland to Grand Bayou Pass Barrier Shoreline Restoration (BA-35), (2010). See Sea Level Rise and Barrier Islands, supra note 113. See supra notes 115 and 116. See Environmental Research Letters, supra note 14 and CCSP, supra note 3 , at 198, 203204, 213, & 23638. See, e.g., M. Burlas, G.L. Ray, & D. Clarke, The New York District's Biological Monitoring Program for the Atlantic Coast of New Jersey, Asbury Park to Manasquan Section Beach Erosion Control Project. Final Report (2001); and U.S. Army Engineer District, New York and U.S. Army Engineer Research and Development Center, Waterways Experiment Station, Draft Environmental Impact Statement September 2009, Beach Nourishment Project, Town of Nags Head, North Carolina. E.g., Orrin H. Pilkey & Rob Young, The Rising Sea (Washington, DC, Island Press. 2009) and CCSP, supra note 3 , at 49, 54. The following factors that contribute to the cost are all expected to rise: The rate of sea level rise, see, e.g., IPCC, supra note 2; the amount of sand required per foot of sea level rise, see, e.g., CCSP, supra note 3 , at 101102; and the unit cost of sand as least-cost supplies are exhausted, see, e.g., EPA, supra note 114, at A-5-32 to A-5-36 (1989). See generally Sea Level Rise and Barrier Islands, supra note 113. In addition, shore erosion and sand requirements may respond to sea level rise with a lag. See EPA at A-5-18 to A-5-20. Such analyses would have to weigh the environmental importance of the estuarine habit lost and the potential environmental benefits from restoring the bulkheaded bay shores to a more natural shoreline, against the environmental impacts of dredging sandy shoals on the continental shelf and filling the nearshore ocean waters. CCSP, supra note 3 , at 5155. Robert Dolan, Paul J Godfrey, & William E Odum, Man's Impact on the Barrier Islands of North Carolina, 61 American Scientist 152162 (1973). Completely restoring the overwash (and related windblown processes) would require lowering dune elevations in many places so that storms would be able to push sand toward the bay side. Efforts may be necessary to ensure that roads and buildings do not block the bayward flow of sand either. When sand washes from the beach onto the streets, people would have to stop returning sand to the beach (or to a landfills) but instead allow it to remain so that it could eventually blow into the bay. CCSP, supra note 3 , at 5456. Frances A. Galgono & Stephen P. Leatherman, Modes and Patterns of Shoreline Change, in Maurice L. Schwartz (editor), Encyclopedia of Coastal Science 651, 653 (2005). Highway departments may also attempt to close inlets to keep roads along the shore intact. E.g., Sea Level Rise and Barrier Islands, supra note 113, at 6368. See especially id. Tables 3 and 4. Figure 12, infra § 3.4.2, illustrates these possibilities.